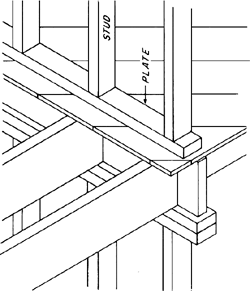 In wood-frame construction, a horizontal board connecting and terminating posts, joists, or rafters; a timber laid horizontally on the ground to receive other timbers or joists. a body having the form of a right prism or right cylinder whose height (thickness) is small compared to the size of the base. Plates are classified according to the shape of the base as rectangular, circular, elliptical, and so on. The plane that divides the thickness of the plate in half is called the medial plane. Plates are widely used in engineering as elements of many structures and buildings, for example, in walls, floors, ceilings, foundations, bridges, and hydraulic structures. They are elements of ship hulls, aircraft, reservoirs, and many machines and appliances. In acoustics they are used as radiators and receivers of sound and as screens in sound fields. According to the character of the loads acting on the plate, a distinction is made between plates subject to flexure under transverse loads and plates subject to tension and compression under loads acting in the medial plane. Flexural deformation causes the points of a plate to be displaced, or deflected, perpendicularly with respect to the medial plane. The surface formed by the points of the medial plane after deformation is called the medial surface. According to the nature of the deformation of the medial surface upon bending, the following types are distinguished: plates that are rigid or experience a small deflection of not more than one-fifth of the thickness; flexible plates, where the deflection is from one-fifth to five times the thickness; and highly flexible plates, or membranes, where the deflection is more than five times the thickness. In rigid plates the medial layer can without appreciable error be regarded as neutral—that is, as free from tension-compression stresses. Calculations for rigid plates as a rule make use of the hypothesis of straight normals, according to which any straight line that before deformation is normal to the medial plane remains after deformation straight and normal to the medial surface; the length of a fiber in the direction of the thickness of the plate is regarded as unchanged. In the case of flexible plates in calculations within the limits of elasticity, not only purely bending stresses must be considered but also stresses that are uniformly distributed over the thickness of the plate. The latter are called either membrane stresses or stresses in the medial surface. In highly flexible plates, or membranes, studies of elastic deformations may neglect the flexural stresses proper as compared to the stresses in the medial surface. When plates are under a load that acts in the medial plane, the stresses are distributed uniformly over the thickness—that is, the plates are under conditions that are more advantageous than in the case of a transverse load. Buckling of the plate, however, is possible in this case, and the plate usually has to be reinforced by a network of stiffeners. Dynamic problems—the calculation of natural and forced vibrations on plates—are of great importance. Plates are of interest as oscillatory systems in acoustics. Plates are classified as thin and thick, depending on their thickness compared with the length of the elastic waves in their interior. Transverse (bending) vibrations and longitudinal (extensional) vibrations are possible in thin plates; in the latter case, the displacements are oriented in the plane of the plate. Bending in thin plates is not accompanied by tension of the middle plane; bending and extensional vibrations can therefore exist independently of each other. The situation is different in thick plates. The vibrations of such plates can be represented as a set of longitudinal and shear waves that propagate within the plate and are reflected at its two sides. In accordance with the two types of oscillations, in a hypothetical infinite plate there can propagate transverse and longitudinal waves. For transverse (flexural) waves, a plate is a system exhibiting dispersion: waves of different wavelengths propagate in the plate with different speeds. The speed of longitudinal waves in a thin plate is independent of the wavelength. Plates of limited size have discrete sets of natural frequencies. To each natural frequency there corresponds a natural vibration form, which can be pictorially represented by a distribution of nodal lines, where the displacements during the vibration process are equal to zero. The natural frequencies and forms of the vibrations depend on the size and shape of the plate and on the conditions of support of the plate’s edges. A vibrating plate is itself a source of vibrations in the medium in which it is located. The radiation efficiency of a plate depends on the elastic properties and density of the plate material and on the properties of the medium in which the plate is located. Bubnov, I. G. Trudy po teorii plastin. Moscow, 1953. Vol’mir, A. S. Gibkie plastinki i obolochki. Moscow, 1956. Vol’mir, A. S. Nelineinaia dinamika plastinok i obolochek. Moscow, 1972. What does it mean when you dream about a plate? A shoe or base member, such as of a partition or other kind of frame. The top horizontal member of a row of studs used in a frame wall. A rolled, flat piece of metal of some arbitrary minimum thickness and width depending on the type of metal. One of the conducting surfaces in a capacitor. One of the electrodes in a storage battery. A smooth, thin, flat fragment of rock, such as a flagstone. A large rigid, but mobile, block involved in plate tectonics; thickness ranges from 30 to 150 miles (50 to 250 kilometers) and includes both crust and a portion of the upper mantle. In etching, the piece of copper, zinc, or other metal that constitutes the base from which prints are made. In photography, a sheet of glass coated with a sensitized emulsion. In printing, the reproduction of type or cuts in metal or other material; a plate may bear a relief, intaglio, or planographic printing surface. A thick flat particle of metal powder. 1.beneath a row of studs. 1. A thin, flat sheet of material. 2. In wood frame construction, a horizontal board or timber connecting and terminating posts, joists, rafters, etc. 3. A timber laid horizontally (and on its widest side) in a wall or on top of a wall or on the ground to receive other timbers or joists. Also See ground plate, wall plate, partition plate, pole plate, sill plate. 5. A flat, rolled-metal product having the following dimensions: hot-rolled steel, minimum thickness 0.18 in. (0.46 cm) and a width exceeding 6 in. (15.2 cm); stainless steel, minimum thickness 3/16 in. (0.48 cm) and a width exceeding 10 in. (25.4 cm); aluminum, minimum thickness 0.25 in. (0.64 cm), no minimum width specified; copper alloys, thickness exceeding 3/16 in. (0.48 cm) and a width greater than 12 in. (30.5 cm). Also See crown plate, curtail plate, false plate, gallery plate, head plate, pole plate, rafter plate, raising plate, roof plate, sill, sill plate, soleplate, top plate, wall plate. 3. a thin coating of metal usually on another metal, as produced by electrodeposition, chemical action, etc.